The plans for the Waldorf Astoria restoration now go to the New York City Landmarks Preservation Commission (LPC) for review. Today, Waldorf Astoria Hotels & Resorts submitted designs for a revamped and restored Waldorf Astoria New York to the New York City Landmarks Preservation Commission (LPC) for review. Global architecture firm Skidmore, Owings & Merrill (SOM) and Paris-based interior designer Pierre-Yves Rochon (PYR) are leading the restoration. “We are at an exciting and transformative point in Waldorf Astoria’s renowned history, during which time Waldorf Astoria New York will be restored to its original grandeur while maintaining a modern and inspirational look and feel,” said John T. A. Vanderslice, global head, Waldorf Astoria Hotels & Resorts, in a press release. 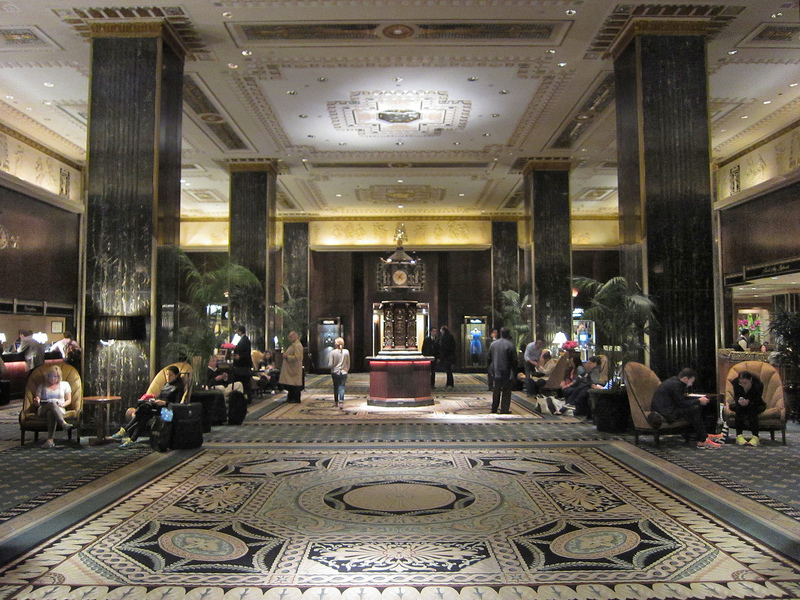 Earlier this month the LPC voted to designate several major interiors in the Waldorf Astoria as landmarks (the exterior was made a historic landmark in 1993.) The move to landmark these interiors came with the news that the Waldorf's new owner, Anbang Insurance Group, aimed to renovate the hotel and convert up to 1,100 of its 1,413 rooms into private apartments and sell them as condominiums. The Chinese holding company originally purchased the hotel for $1.95 billion in 2014. 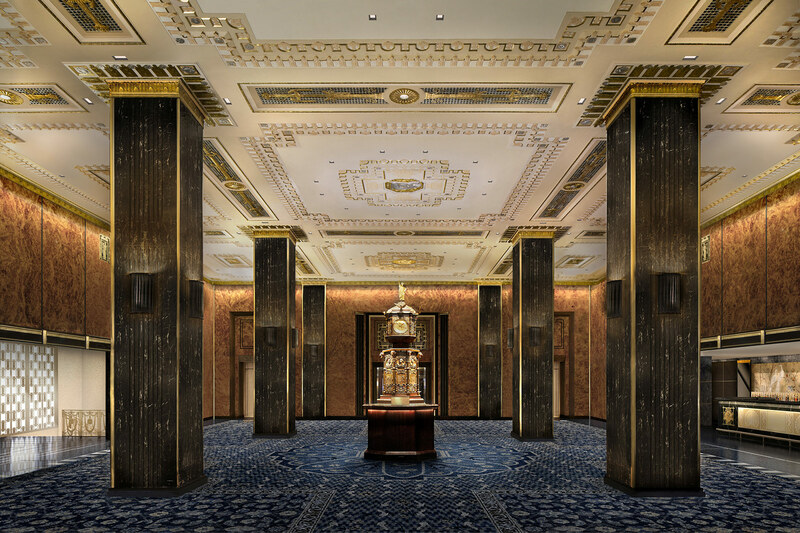 “We have assembled a world-class design team with unparalleled experience restoring and revitalizing historic properties to create a proposed plan that treats the Waldorf Astoria New York’s history with respect and dedication to detail,” said Brandon Dong, Anbang Insurance Group, in a press release. “The restoration of the beautiful landmarked spaces is central to the Waldorf Astoria New York’s future as a New York City icon and global destination.” SOM will be the design architect while PYR will serve as the interior designer of the hotel's public areas and guest rooms. “Protecting the spirit of this iconic property and reflecting its history through a modern, more forward-thinking lens will be at the heart of the hotel’s interior design. From the overall atmosphere down to the finest Art Deco details, American grandeur and international glamour will meet in the Waldorf Astoria New York—no other hotel in New York will compare,” added Pierre-Yves Rochon, principal and global design director, PYR. Anbang knows the Waldorf’s history is a large part of what makes this hotel so special. That’s why we fully support the LPC’s recommendation for what would be one of the most extensive interior landmark designations of any privately owned building in New York. These designations are consistent with our vision and will protect the Waldorf’s significant public spaces. We are now finalizing renovation plans for the Waldorf that preserve these spaces and will ensure that the Waldorf will provide memorable experiences for generations to come. We look forward to sharing our plans publicly when they are complete. The spaces under review include the Park Ave foyer and colonnade, the West Lounge (a.k.a. “Peacock Alley”), the East Arcade, the Lexington Avenue stairs, assorted lobbies and vestibules, the Ballroom entrance hall, and the famous Grand Ballroom. The ballroom hosts many high-profile events, including the Al Smith dinner that serves as comedic relief each presidential election season as the two candidates take light-hearted jabs at each other. The decadent architectural details inside represent an early embrace of the Machine age, even if in a “superficial way,” as described Marianne Lamonaca, author of Grand Hotels of the Jazz Age, a 2005 book about New York’s remarkable hotels of the era. "This is one of the most distinctive interiors in the city," Commissioner Frederick Bland explained. "In Delirious New York, Rem Koolhaas writes a whole chapter on this extraordinary city within a city. I always encourage my students to visit this sequence of spaces. That is what make this so special to me. It is public, or nearly public. To walk on that main axis, entering from Park Avenue, and ending up down a level on Lexington is wonderful. It is probably my favorite interior in all of New York. The fact that it is not landmarked already is really horrifying. This is a delightful day for me." A major renovation is in the works for the iconic Waldorf Astoria hotel, which will be gutted and converted primarily to luxury apartments over a three-year period. The building will close for renovations starting in spring 2017 until 2020. While the exact details of the renovation haven’t been revealed, The Wall Street Journal reports that the hotel’s owner Anbang Insurance Group plans to convert up to 1,100 of the hotel’s 1,413 rooms into private apartments and sell them as condominiums. The other 300-500 rooms will also be upgraded but will remain in use by the hotel. Until recently, a similar plan was in place for the Sony Tower on Madison Avenue, but the building was sold to owners who scrapped a scheme to build luxury apartments in favor of offices. The Waldorf Astoria is one of the world’s most famous hotels, and has been synonymous with luxury since opening in 1931. The architecture firm Schultze & Weaver designed the Art Deco style building in the late 1920s, after the hotel’s original building was torn down to make way for the Empire State Building. High-profile tenants have included Marilyn Monroe, Winston Churchill, and Douglas MacArthur; currently there are fewer than 200 suites available for monthly rental. 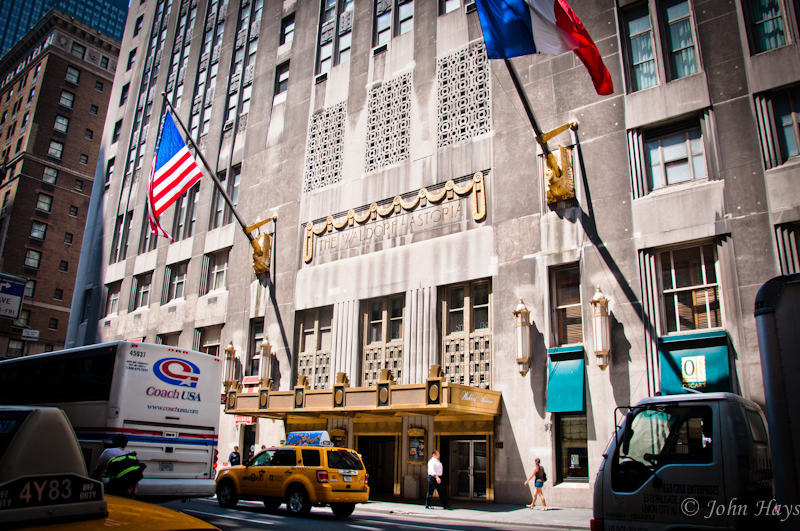 The hotel is a popular destination for celebrities and others looking for a luxury stay in New York. Anbang Insurance Group will invest up to $1 billion in the renovation. The Chinese holding company purchased the hotel for $1.95 billion in 2014, making it the most expensive hotel sale in history.